john4jack (Corvallis, Oregon, United States) on 22 November 2009 in Transportation and Portfolio. Couldn't resist putting up a few more train shots. Fiona loves the steam. Today I give gratitude for being 74 years on the incredible Planet Earth. My life has been a phenomenal blessing. Thank you for sharing the journey. The following is a quote from David duChemin's ebook, "Ten More." It's from the section "See with eyes; Shoot with the heart." It is my birthday gift to each of you. "The world in no way needs more mediocre photographs. What the world does need is more passionate photographs, images that begin life perceived by the eyes but expressed, through the camera, with the heart. If you’re going to create better photographs, begin with things about which you care deeply. If that’s the natural world and issues of conservation, show me. If it’s your children, then show me them. Photographing those things about which you are passionate does a couple of things. It shows me more of you. It shows me more of that thing you love. And it makes better photographs." Arriving by train in a plume of smoke! The angle of view gives the appearance of an animal friendly and proud. I like the tone amber! Very Beau Jack! Great light and colors, impactant! I like very much the scene and framing, and also this beautiful old machine. Beautiful capture! Don't you just love those old steam locomotives? Happy Birthday to you !!! Thank you for the wonderful quote today and for the wonderful head of yellow steam. You just keep on chuggin' through life ...and don't stop taking those passionate photographs !!! look at all that beautiful smoke! or is it steam? @Seraphine: Thank you. Smoke, steam; you name it. Very good picture ! Happy Birthday Jack ! It's great to meet 74 years! Be glad of life! Having enthusiasm for this wonderful nature photograph ... Your precious steam engines! and teach it to others. Seen in the television this week a report on steam trains in Germany.Then I thought of you.Happy birthday and good day. Happy Birthday!! Hope you have a great day and may the years to come be filled with lots of joy, happiness and love! HAPPY BIRTHDAY Jack ! A lot, a lot of memorable good things for you. Joy, Happyness, Health... everything you need. @zOOm: Merci. What day is yours? Many happy returns of the day to you, Jack. What a photo to celebrate..what colours! Hope you have a lovely relaxing day! @MrsAmber: Thanks. The kids and grandkids are coming for brunch. Mid-afternoon there is a symphony concert. Ellie and I had an elegant dinner out last night. Happy Birthday. May God bless You, and keep You, may His face shine upon You, mayHe give You His peace. What a wonderful light and steam! @Mirjam: Thank you for your blessing. Certainly is awesome Jack! I love the light and warm tones! Great capture, the light and the details are excellent, Happy Birthday to you ! You're 15 months ahead of me, so 'young man' - have a wonderfully Happy Birthday. Hopefully Fiona will help you blow out your candles! I love the steam too! @Judy: You sweet young thing!! Thank you. Fiona certainly won't have to be asked. There's a family brunch. A spectacular shot in the late afternoon light. Love the billowing steam and golden tones. @bluechameleon: Thanks, Sharon; and thank you for your BD wish on Facebook. Taken as the sun is setting? That warm glow of red side lighting is just fantastic! @zOOm: If my mother were alive, hers would have been Thursday. My wife also is a Sagittarius, but hers is in December. Being on the cusp, I have felt like a Sagittarius the first half of my life and a Scorpio the second. This is a fine action shot of the engine coming in. Love the ruddy sunlight and the billowing smoke/steam. Congrats on the birthday... and many, many more. Happy Birthday to you !!! This is absolutely outstanding!!! Happy Birthday! Thanks for sharing your photos with us. A lot of good things for you!!! I'm with Fiona.....another beautiful shot, and that light....ummmmmmm...just delicious !! and appears it's your birthday....Happy, Happy, Happy !!! Hope you have a great day!!! One believes to be last century. Miraculous admission with nice light! Fantastique ! on se croirait dans un western ! Wow, I love the quote from David duChemin. How true and what a nice birthday day present from you to all of us. Happy, Happy Birthday. You're the same age as my darling husband. The picture is delicious and as Ray just said "what a beautiful engine, I would love to take a ride on one of those." Beautiful photography Jack, you must love trains. @Marion: Thank you. 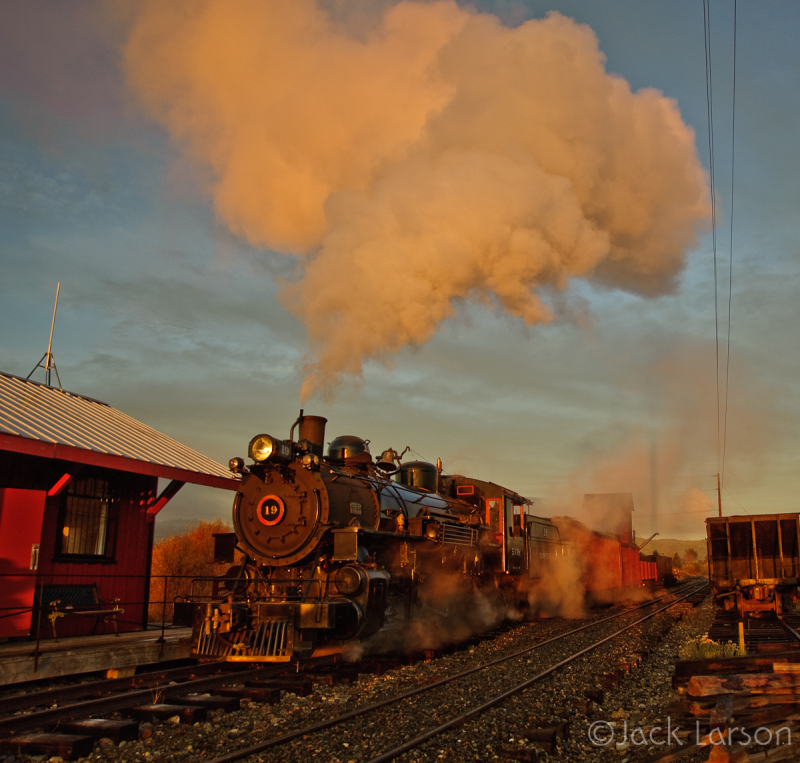 Actually all of the train stuff is because our photo arts guild went to Sumpter specifically for the one day of shooting the old trains on the Sumpter Railway; it was a day designed for photographers. Happy Birthday! You have youthful, fresh but experienced photographic eye. nicely captured and well framed with great lighting.. Happy Birthday to you Jack ! best wishes from your french Am3 friend ! a beautiful picture in warm light and colors ! love the steam ! @Anna.C: Merci, dear Anna. And thank you for your comments on my other recent photographs. Happy birthday! Looking forward to many more great photos! @Julia: Thank you, Julia. Becoming connected to your blogsite has been a special birthday gift. an excellent capture, so very beautiful how the steam picks up the color from the sun. @MARIANA: Thank you, Mariana. Your warm hugs are especially appreciated on this day! Fantastic image with perfect soft warm light! Happy birthday and thanks for the great quote! @Scott F. Schilling: Many thanks, Scott. You and your work certainly have been one of the major gifts this past year. Happy Birthday! I'm with Fiona on that cloud of steam. It's great in that fine warm light. @Steve Rice: Thanks, Steve. Fiona helped me blow out my candles. Happy birthday. Superb shot. I love the tones. Well done, Jack. Well said, and well demonstrated. Trains seem to be a passion of yours. I also, love the steam. Great work you do, and hopefully love as well, at least that's what I feel from looking at your shots. Thanks for sharing your birthday with us. @LauraS: Thanks, Laura. Trains actually are not a passion of mine, but they became my passion for a day. Happy birthday dear Jack !!! the REAL train, proud & proper, nice presentation. Happy Birthday Jack! And many more. What wonderful golden light on this train. it rocks! Very beautiful colors and tones .... And Happy birthday ! The Old Lady is glorious in appearance and <breathing> well! Another Novemeber child.....there are so many on Aminus3! Though late, Happy Birtthday to you, Jack! And ...many more to come! You don't have to resist at all ! Nice composition. Oh dear, I missed the party!!! Happy belated birthday Jack, stay healthy and keep on making beautiful pictures!! i love this ruddy light -- and the formation of the steam into a spiraling cloud -- beautiful! Wonderful lighting. I feel like I'm in an old western. Yeah... a magnificent pic for this day... congrats for your lovely shots every day, and happy birthday, Jack. Beautiful light and colors, especially on the steam. I am a little late but Happy Birthday Jack!! the golden light is stunning! @Claudia: Thanks; it was gorgeous morning. C'est autre chose que les locomotives electriques !!!!! un petit air d'autrefois, et de magnifiques couleurs. Glorious light Jack and a fantastic shot! Don't you just love David duChemin?? Do you have his books, Jack?? @Toni: Dave is a chief mentor of mine these days. I have all of his ebooks and his "Within the Frame." Jack, was this photo featured in a book? Or e-book? I recall seeing it but can't now find it. Just curious. Really lovely. And happy belated, belated birthday. Thank you for sharing your wonderful work and knowledge. @Frances Berry: Thanks, Frances. This is its first appearance in public.